"Even modest improvements can justify hiring a coach. An investment of $30,000 or so in an executive who has responsibility for tens of millions of dollars is a rounding error." The demand for executive coaching has experienced rapid growth. Executive coaching is now a multi-billion-dollar industry. All signs indicate that executive coaching is a sound investment. Studies report an impressive ROI of 500-800 percent. A study conducted by MetrixGlobal LLC, for example, reported an ROI of 689 percent associated with executive coaching (and this finding accounted for the entire cost of coaching, including the opportunity costs associated with the time leaders spent not on the job in coaching sessions). Citing similar results, the International Coach Federation (ICF) has presented a body of research demonstrating that coaching tends to generate an ROI of between $4 and $8 for every dollar invested. On the other hand, it’s important to note that Anthony Grant of the University of Sydney claims that too strong of an emphasis on financial returns can result in coaching interventions that increase stress and anxiety. To avoid narrowly focusing on financial returns, it’s important to consider the multitude of tangible and, perhaps more important, intangible benefits of coaching and develop goals accordingly. Often, when an executive coach is engaged, business transformation is top of mind. Executive coaching efforts often focus on change management, yielding important results. It is common for organizations to seek out executive coaches who are adept at developing new business practices, implementing new technologies, or adopting new strategies. The tangible organizational benefits of executive coaching are manifold. Research by Performance Sales Executive Council found that effective coaching directly increased sales performance. On average, executive coaching of core sales representatives resulted in an 8 percent performance increase. A study published in the Manchester Review that primarily investigated executives from Fortune 1000 companies reported that executive coaching leads to improved customer service (39 percent frequency), cost reduction (23 percent) and increased bottom-line profitability (22 percent). While there is a multitude of different tangible benefits associated with executive coaching, many benefits don't appear as line items on financial statements. Executive coaching often focuses on leadership skills and relationships with managers, direct reports, co-workers, and other stakeholders. In these cases, executive coaches focus on teamwork, problem solving, decision making, and conflict resolution skills. The results can be transformative. A survey reported by Clear Coaching Limited found that executive coaching resulted in improvements in work relationships within a team (50 percent frequency), employees' abilities to see others' perspectives (47 percent), and improved atmosphere (40 percent). In a world where the strength of an organization's culture is increasingly trumping salary levels in terms of importance to employees, these intangible benefits are more relevant than ever. An often-overlooked intangible benefit of executive coaching is stress reduction. Executive coaches can empower executives with an arsenal of tools and tactics to combat stress and, in turn, improve productivity levels. A study by Jan Ramsøy and Sigrid Stover Kjeldsen, in cooperation with the Norwegian University of Life Sciences, found that coaching reduced executives’ stress levels by, on average, 18 percent after only eight to 10 coaching conversations (some participants experienced stress level reductions as high as 47 percent). Perhaps what’s most powerful is the fact that effective coaching appears to be contagious! Research by Dr. Sean O’Connor & Dr. Michael Cavanagh of The University of Sydney found that the closer employees are situated to individuals who have participated in coaching, the higher their levels of well-being. 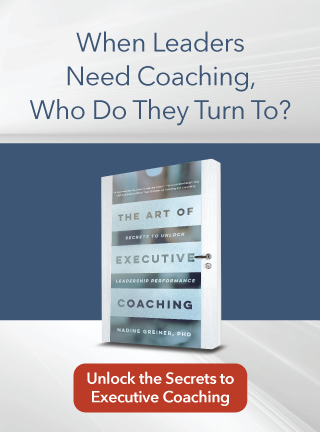 Whether you’re examining bottom-line results or the holistic impact on people’s lives, executive coaching is a benefit to everyone in and around an organization. Nadine Greiner, Ph.D. is the CEO of On Target Solutions, which provides full-suite contemporary Organization Development Solutions. Dr. Greiner teaches in masters and doctoral programs, coaches and trains other consultants, and wrote The Art of Executive Coaching. Since she first served as a CEO at the age of 38, she understands leaders’ experience first-hand. Nadine Greiner offers her clients the expertise that comes along with 30 years of consulting success, and a dual Ph.D. in Organization Development and Clinical Psychology. She loves animals and Zumba. Thanks for your article Nadine. There is now further evidence of the Coaching Ripple Effect in the groundbreaking research by Dr Sean O’Connor & Dr Michael Cavanagh (2013). They are in fact colleagues of Tony Grant at the University of Sydney. To give a balanced view, Tony’s article on ROI as a poor measure of coaching success (2012) is also worth a read. @Angela: Updated!! Thank you again!! Angela! Thank you so very much...I will be updating with this vital information (from both perspectives!). Thank you again!